Highly qualified final year undergraduate students or those who have received an undergraduate degree of all disciplines may apply for the DAAD Study Scholarship for a full Master's degree program at a German university or for study at a German university as part of a postgraduate or Master's degree program completed in the home country. Study Scholarship for in the Field of Music. Study Scholarship for Performing Arts. Study Scholarship for Fine Art, Film, Design/Visual Communication. The DAAD online portal will close automatically at 11 PM Central European Time (5 PM EST/4PM CST/3PM MTN/2PM PST) on the deadline date. Applicants are advised to start the application process at least one week before the closing date. Results will be announced on the portal by the end of March. Students in their last year of undergraduate studies at an accredited US or Canadian university. Foreign nationals who live in the USA or in Canada by the time of application deadline are eligible, if your last degree was obtained in the US/Canada, or you will have received a degree in the US/Canada before your scholarship starts. All other foreign nationals may need to apply via a different DAAD office. Recent BA/BS or MA/MS graduates who completed their last degree no longer than 6 years ago. US/Canadian students in the first year of a Master’s degree program in Germany may apply to fund their second year. Applicants may not have been living in Germany for more than 15 consecutive months by the time of application deadline. Payments towards health, accident and personal liability insurance cover. Travel subsidy, unless these expenses are covered another source of funding. A very limited number of scholarship recipients may be awarded an additional two-month intensive language course grant. This language course grant is decided upon by the independent selection committee and does not require a separate application. DAAD scholarship recipients are not permitted to receive supplementary funding through any other German funding body. Supplementary funding from a non-German funding body may in some cases be permitted. However, they would then be treated as additional earnings, i.e. grants exceeding the tax-free income level in Germany (currently EUR 450 per month) would be deducted from the DAAD scholarship, unless the grant payments will be put on hold for the duration of your DAAD scholarship. The additional study visit is essential for achievement of the scholarship objective. The additional study period is no longer than a quarter of the scholarship period. Longer periods cannot be funded, even partially. The additional study period does not take place in applicant’s home country. Please note that we can only offer funding for the following periods. For a postgraduate or Master's degree completed in Germany: between 10 and 24 months depending on the length of the chosen study program. Applicants who are already in Germany in the first year of a Master's program at the time of their application may apply for a scholarship for the second year of study (12 months: October 1, 2020- September 30, 2021) ; an extension is not possible. Applicants who are applying only for the first year of a Master's program or those who will be starting a 1 year Masters' program in Germany (10 months: October 1, 2020- July 31, 2021) ; an extension is not possible. Usually one academic year (October 1, 2020-July 31, 2021) ; an extension is not possible. 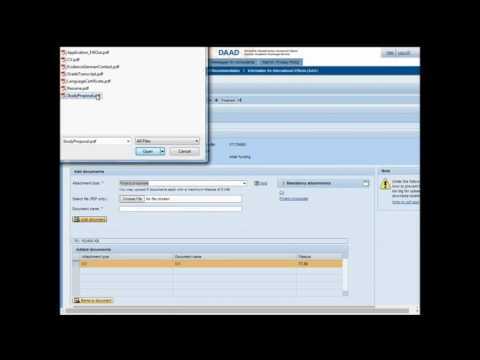 The application procedure occurs online through the DAAD portal. Your reference has to be sent by post to the DAAD New York office. The portal will close automatically at 11 PM Central European Time (5 PM EST/4 PM CST/3 PM MTN/2 PM PST) on the deadline date. Applicants are advised to start the application process at least one week before the closing date. 1. Check here if your University is a DAAD Partner University. At a DAAD Partner University: contact your DAAD campus coordinator first and follow the application guidelines for your university’s pre-selection. Please note that your university may have an earlier internal deadline. (if you miss your university’s deadline, you may follow the general application guidelines below). This does not apply to short-term research grant applicants or to performing/visual artists. Not at a DAAD Partner University: follow the general application guidelines below. Please use this checklist to ensure you submit a complete application (see the box on the right for additional application documents). These guidelines are region specific for North American applicants only. You will find some different details on the application portal and the DAAD Bonn website, such as maximum pages; the instructions on this checklist supersede any conflicting information potentially found elsewhere. Certificates, proof of credits, certifications and translations maybe scanned in non-certified form, and uploaded to the DAAD portal. Step by step Manual for Personal Funding. Technical support with the online portal, please email portal(at)daad.de. Video below for help with the online portal. Results will be announced through the portal at the beginning of April. The application documents remain with DAAD. Data relating to applicants is saved by the DAAD in accordance with the Federal Data Protection Act insofar as this data is needed to process applications. Applications to this program are currently not possible. Please see the program details for more information. Check out the Manual for Personal Funding on daad.de. On this site you can download manuals to assist with the personal funding section of the DAAD Portal. If you seek technical support with the registration or the online application please e-mail portal(at)daad.de. If you have questions regarding the DAAD Study Scholarship, please contact kim(at)daad.org. (Kindly understand that questions already answered by information on DAAD’s website cannot be answered separately). A list of previous scholarship recipients can be found here. See here for Frequently Asked Questions.